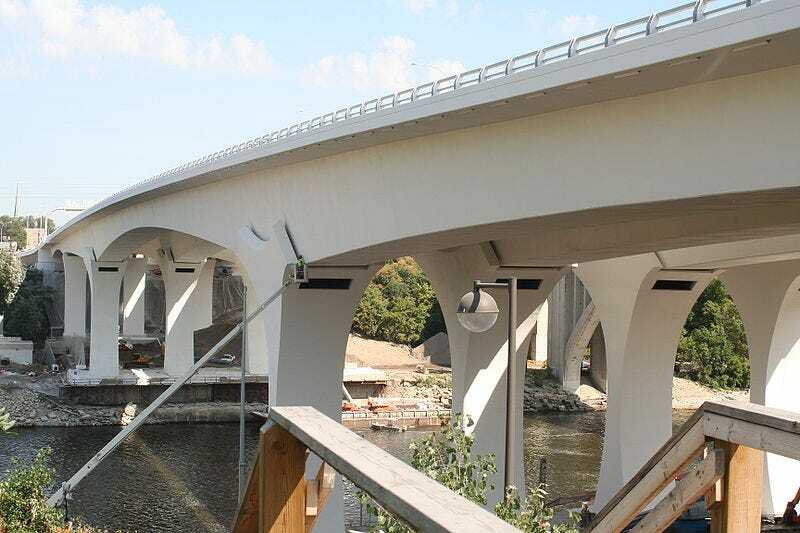 The bridge built to replace the one that crumbled like delicious goat cheese in Minneapolis in 2007—is a smartie, packed with built-in sensors that perform wonders like automagically de-ice the road in winter. BusinessWeek uses the new bridge as its case study for the future of smart infrastructure, marrying concrete and silicon in major construction projects—which are where big dollars are going as part of Obama's stimulus plan, to provide jobs through "shovel ready" projects. Apparently, there's some debate as to how "smart" these projects need to be: smart, smarter or smartest, as BW puts it. Bleeding edge tech obviously costs more, so striking a balance is key. Less than one percent of the cost of the St. Anthony Falls bridge was spent on the sensor system, which tracks weather, stresses and even traffic, and it'll save money in the long run, with its automatic de-icing system cutting "weather management" costs by 10 to 50 percent. It's the incorporation of the smart sensor tech that actually won the contract to build the bridge for the FIGG team. The next step will be wireless sensors that are even cheaper, so it'll be loaded up with thousands of them, not hundreds. You'd think they coulda made it a little less ugly though.